StoneCare of Texas serves San Antonio as a leader in stone maintenance and restoration providing all the care you need for marble, granite, slate, terrazzo, limestone, and concrete. From residential to the corporate level, we can customize our service to meet your mintenance and restoration requirements for your floors, showers, walls, monuments, fountains, countertops and more. StoneCare of Texas has continued to grow with the support of the building and residential community. We have had the opportunity to build long-term working relationships with many designers, architects, builders, and installers by providing the best service and craftsmanship possible. StoneCare of Texas was established in 1994 to fill the growing need for maintaining and restoring natural stone and tile. Our professional staff has over 35 years experience. We are locally owned and operated. Natural stone surfaces are porous and can easily lose their luster and value due to damage resulting from foot traffic, spills, acidic cleaners, and everyday wear. StoneCare of Texas can return your stone back to its original beauty. Diamond Grinding StoneCare of Texas believes in a natural finish and does not use waxes or other surface coatings on polished stone, but uses a diamond grinding process to achieve a high gloss finish. Our Mission is to be the finest company in the service industry, to deliver quality results with a great attitude in a timely manner. A company that cares about its employees and clients. 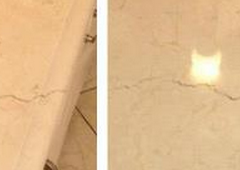 Please contact us to discuss your natural stone restoration needs. Granite Repair, Marble Floor Polishing, Refinishing, Cleaning, Sealing, Travertine Cleaning and Repair, Stone Restoration, Slate Cleaning, Color Enhancing, Stain Removal, Etch Removal, Serving San Antonio TX and surrounding areas. I just wanted to drop you a note of thanks... StoneCare responded with knowledgeable people who quickly assessed the problem and confidently provided a suggested fix [to our problem]... The end result was a floor that we were proud to show off. Your firm succeeded in "pulling a rabbit out of a hat." You responded on extremely short notice and did exactly what you said you were going to do. Thank you.